Cale is a PhD student in the Department of Biomedical Engineering at Case Western Reserve University (CWRU), where he commenced research in the summer of 2015. His research interest involves restoration of movement to persons with paralysis due to spinal cord injury. In order to restore this movement, Cale focuses on utilizing functional electrical stimulation (FES) coupled to brain computer interfaces (BCI). He is particularly interested in deriving additional information from the human cortex by exploring alternatives and supplements to the traditional Kalman velocity decoder. 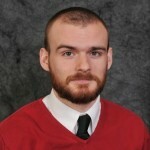 Before joining the CWRU BrainGate team, Cale completed his undergraduate training in Biomedical Engineering at The University of Akron in Akron, Ohio. Beginning in the summer of 2010, Cale began conducting research in the laboratory of Yang Yung, PhD, at The University of Akron on numerous research projects that focused on drug delivery devices, gene therapy, and blood fluid dynamics. In the summer of 2012, Cale participated in a Research Experience for Undergraduates (REU) at the Center for Sensorimotor Neural Engineering under the direction of Bill Shain, PhD, to characterize immune responses to BCI electrode insertion. Beginning in January 2013, Cale began a year-long engineering co-op at Northeast Ohio Medical University in the laboratory of Fayez Safadi, PhD. There, he worked to elucidate orthopaedic cell biology following traumatic injuries and subsequent treatments. In the summer of 2014, Cale completed an REU at the University of Pittsburgh in the Human Rehabilitation and Neural Engineering Laboratory under the supervision of Jen Collinger, PhD. There, he worked to characterize neural noise in a clinical trial involving intracortical BCI control of robotic prosthetic limbs. Cale’s research has been recognized through the Goldwater Scholarship and the National Science Foundation Graduate Research Fellowship.